Do You Understand How Interest is Calculated on P2P Loans? Most people think they understand how interest works. You invest $100 at 10% then your annual interest payment is $10 a year. If you are investing for a fixed term, say three years, that will mean $30 in total interest payments. Simple math. But with p2p lending it is different. This same $100 invested in a 36-month p2p loan at 10% will get you far less interest than $30. If we compare apples to apples and assume no service fees then this $100 investment will net you around $16.15 in interest, close to half the interest from the previous example. What gives? Are you really getting just over 5% or so annually on your money? No. The reason the total interest is less is because you are investing in a fully amortized loan. What this means is that with each payment you are being paid back some principal as well as interest. Let’s continue our example to demonstrate. The monthly payment for your $100 loan at 10% is $3.23. Given a standard amortization schedule the first payment is split into $2.39 of principal and $0.83 of interest. So, your $100 investment has been paid down by $2.39 and the principal balance is now $97.61. 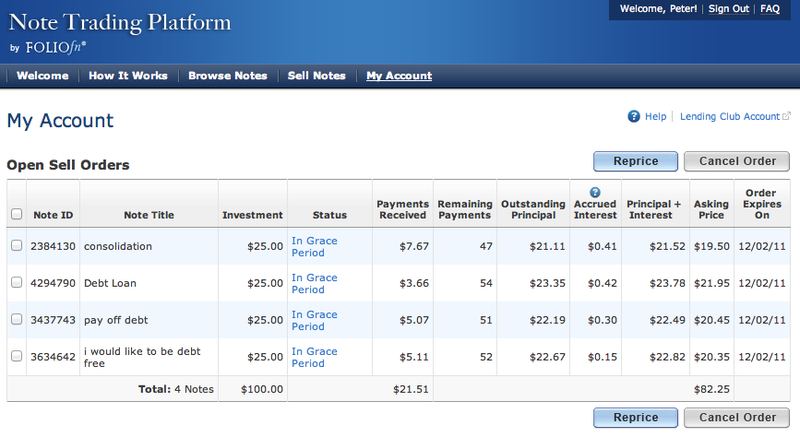 S0, next month you will not receive interest on $100, you will receive interest on $97.61. Herein lies the big difference with amortized loans. Below is the full amortization schedule for a $100 loan at 10%. Now, keep in mind I am ignoring service fees in this example – in reality at Lending Club and Prosper a 1% service fee is deducted with each payment. This morning I awoke bright and early to do an interview about peer to peer lending with local Denver TV station 9News. Their business reporter, Gregg Moss, has taken an interest in the subject and asked if I would come in to the studio to do an interview at 5:40am. So, there I was before dawn in their “Information Center” talking on the air about my favorite topic. The video is below and you can also see it along with a short article on the 9News site. We don’t go into any depth about p2p lending at all here, we cover just some of the basics in our two and a half minutes. But it is all part of my goal of spreading the word to the general population. I get a ton of questions from readers who are new to peer to peer lending. There really hasn’t been an up to date and independent resource available where people can find out about the basics of peer to peer lending. Well, now there is. I have just finished writing a new ebook titled, Understanding Peer to Peer Lending. It is not really the encyclopedic volume suggested by the graphic, it is just 13 pages long, so it is a quick read. The ebook is completely up to date with statistics that are current through the end of March. There is a lot of new content including sections about the history of p2p lending, why it is becoming so popular, and guides for borrowers and investors. I intend to be updating this ebook every quarter so there is always an up to date resource for the many new people who want to find out more about peer to peer lending. If you subscribe to the Social Lending Network via email you should have already received notice about the publication of this book. If you would like a copy then you can just fill out the email box at the top of this page. This will also subscribe you to the regular blog updates via email. Alternatively, you can just fill out the form below with your email address. Getting started with peer to peer lending can be a bit daunting for new investors. Lending Club and Prosper offer hundreds of loans to choose from and a myriad of ways for you to invest your money. Some people, eager to get started, jump out of the gate without thinking through their options and end up disappointed with their investment returns. The shrewd investor does some initial planning and research in order to get off to a great start. Here are a few points to consider to help you do just that. For most people, lending their own money to strangers may not be an idea that exactly exudes confidence especially in this day of ongoing credit crisis. But social lending is becoming a more viable option for many, provided one can get over the initial idea of lending or borrowing money from their peers who are also likely strangers.